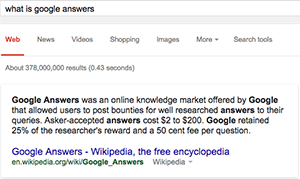 I actually suggested this back in November 2014 in my story named How Google Can Screw Publishers Less With Google Answers: A Solution. I said, build in a way into Google Webmaster Tools where publishers can control some of what is displayed in the Google Answers if/when Google picks their content to display in the Google Answer box. Then in February we saw Google test forms of this in play. Now, supposedly Gary Illyes from Google said at SMX that Google is working on something like this. Via Jennifer Slegg, both Pete Meyers on Twitter and Reeva on Twitter quote Gary as saying this is coming. I think this would be awesome and a good step forward to making publishers less upset with these answer boxes. @rustybrick @methode Sorry, it was more of a "We're discussing how best to do this" thing.